While "fumetti" is just the Italian word for "comics" it's generally understood in America to mean comics that are created using photographs. So while "comics" are defined without a particular set of tools needed in their creation, "fumetti" (at least by the American definition) requires the use of a camera of some sort. Meaning that fumetti could not have existed prior to the 1800s. But what was the first fumetti? Who was the first person to put together a series of photographs to display a narrative? The Wikipedia entry only goes back as far as 1960 and Harvey Kurtzman's Help! Although it implies Kurtzman wasn't the first to do this, the article doesn't cite anything earlier, focusing mostly on the form's relative popularity in the 1970s. Lacking a definitive answer anywhere I can find, I think a strong argument could be made for Eadweard Muybridge's Sallie Gardner at a Gallop from 1878. You might be familiar with the sequence, at least nominally so. Leland Stanford hired Muybridge to figure out if all four of a horse's feet were ever in the air simultaneously while it galloped. 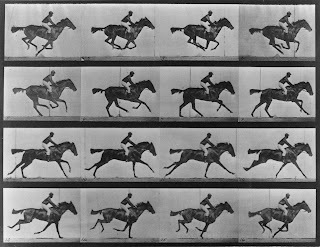 It was the subject of some debate as the human eye couldn't process things fast enough to see in person, and so Muybridge went about trying to capture the image of a horse running while all of its feet were in the air. Muybridge in fact did manage, through trial and a lot of error, to get a single photo of a running horse with its feet off the ground in 1877. A print was sent to the local press (this was, as I said, something of a debate after all) but there was evidence that the photo negative had been retouched and it was generally dismissed. The following year, Muybridge tried a different approach. Rather than using a single camera and hope for a great shot, he set up a series of 24 cameras, mounted about 2½ feet apart alongside a race track. He then rigged the camera's shutters to tripwires laid across the track. Using this method, as the horse ran over the tripwires, the camera it was attached to would automatically take a picture. He then directed one of Stanford's jockies, a man by the name of Domm, to run Sallie Gardner at about 36 miles per hour on the track. The result was that Muybridge got 24 photographs of Domm riding Sallie Gardner, each taken about an eighth of a second apart. Indeed, several of the pictures show Sallie Gardner with all of her feet off the ground. Now, this is often showcased as a precursor to film. The images are put together as a flip-book of sorts, and showing all 24 images in the span of about three seconds gives the illusion of motion. That's basically how movies work. 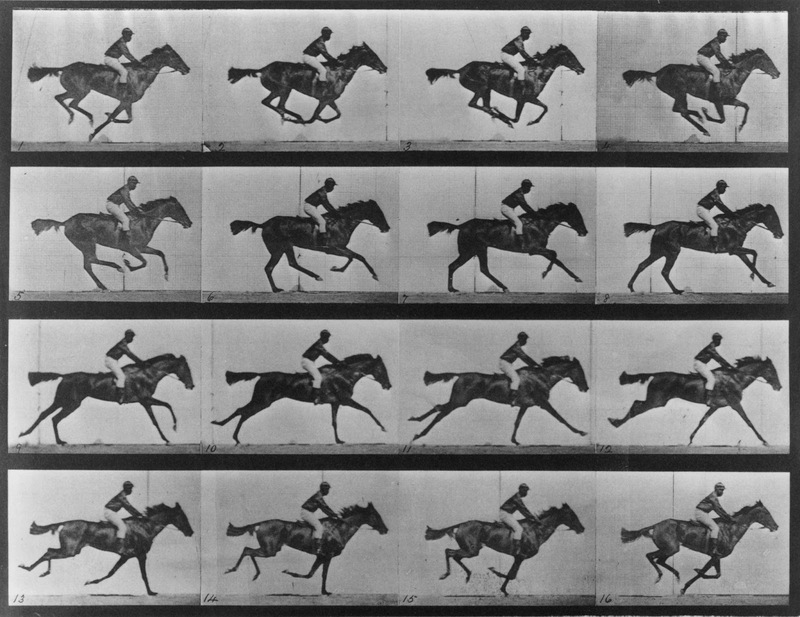 Muybridge figured out a way to create movies before movie cameras existed. But pause a moment. Muybridge used 24 individual cameras. Each camera took a single image. The point of the exercise was to capture a still image of a horse mid-stride, and the images were circulated as a sequence of still images like I've included here. Muybridge was trying to capture motion, but for the express purpose of slowing it down to a series of still images, not in order to replicate the motion itself. The series of images doesn't have a plot, but there is a very deliberate sequence here. That's comics. Created using photographs. That's fumetti. Muybridge went on to do more movement studies in a similar fashion, largely funded by the University of Pennsylvania. Those studies amount to around 20,000 additional images, which made it into an 1887 book called Animal Locomotion: An Electro-photographic Investigation of Consecutive Phases of Animal Movements. So, any other earlier candidates for first fumetti? There is a direct link to the origins of comic strips. There is evidence that the early, pioneering - and rather good - French comic strip artist Caran D'Ache was influenced by Muybridge's photos (which became well known in Paris). Many of Caran D'Ache's early strips were evidently very naturalistic attempts to show that he could reproduce a series of drawings in close sequence to faithfully reproduce human actions. Often a few characters moving in a limited space. I don't think he used photo-reference. It was more that Muybridge's pictures inspirered him to do narrative picture strips. Possibly not his only influence, of course. I don't have any reference for this to hand and I'm away from home / notes. Might be worth a Google.